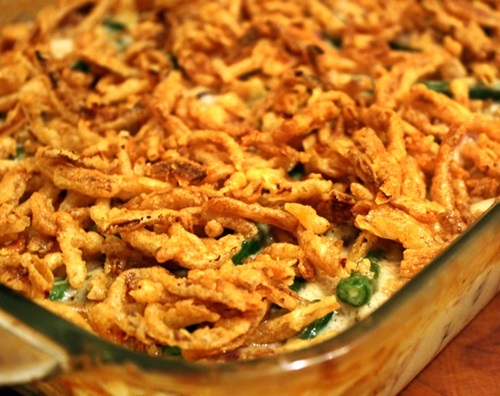 This recipe is the best green bean casserole I've ever eaten in my life. While I absolutely love green bean casserole, I don't much care for the condensed cream of mushroom soup that goes into the majority of recipes out there. So, in an effort to stick with a family tradition I changed things up a bit and ended up with a better, and far tastier way to prepare everyone's favorite holiday classic... green bean casserole! Instead of using condensed cream of mushroom, I replace it with dry onion soup mix which packs a flavorful punch that will have the whole family raving. The first time I made this particular green bean casserole recipe I was aiming to keep the overall taste of the dish as close as possible, but add a lot more flavor and omit the mushrooms. It turned out to be all of that and so much more. I am one hundred percent convinced that once you try it this way, you will never go back to the old condensed soup version. It's a steep claim to make, I know, but it really is that tasty. Enjoy! Combine the onion soup mix, milk, soy sauce, pepper, green beans and 1 1/3 cups French's fried onions in a large bowl. Mix well. Transfer to a prepared, 3 quart casserole dish. Bake for about 25 to 30 minutes until heated through. Stir well to ensure the flavor is evenly distributed. Top with the remaining French's fried onions and bake for another 5 to 10 minutes, until golden brown and bubbly around the edges. Stir in 1 1/2 cups shredded cheddar cheese or cheddar flavor soy shreds before baking for a savory, cheesy green bean casserole your family won't be expecting. Alternatively, you can keep the recipe as is but substitute the cheddar flavored French's fried onions for the original still have that tasty cheddar taste without the actual cheese. Either way is delicious... I've made it both ways and it went quick on both occasions.